Work out the "knots" with a deep kneading and tapping mode. BRAND NEW CHAIRS - $2499 Including Ground Shipping. Luxurious Leather on the seating surfaces. Leather Match on the back and sides. Memory Foam in the seat cushions. 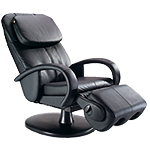 Power Recline allows you to adjust the back of the chair with the handheld controller. Power Footrest allows you to adjust the footrest up and down. Robot Rotating Calf & Foot Massager footrest has 2 speeds and one program. Feels like strong hands providing a powerful three-dimensional massage for your calves and feet. Three Adjustable Height Levels for the length of the massage range up to 25.5". Adjustable Width of rollers in rolling and percussion modes. Chair swivels on its Base from side to side. Auto Restore stops all massage functions and restores the backrest and footrest to their respective starting positions. Seat Width (between arms) is approximately 20.5"
Refurbished LEATHER HT-125 Massage Chair + Warranty* - Black - $999 Cashew - $999 Shipping Included! Full-Body Stretching The calf massage wells will gently hold your legs as the chair reclines to arch your back and engage a gentle body stretching program with an active massage of your lower back. Hi. I just wanted to say I got my HTT- 10i- CARP chair yesterday, and I could not be happier with it. I was a little worried about ordering a massage chair over the Internet. Your web page made it easy to do and the chair arrived within just a couple days. Your shipping partners delivered it in perfect condition. The 10i chair that I ordered was not available locally, plus I saved from not paying sales tax, and your free delivery saved me more. Thanks for meeting all my expectations. - James E.
Amazing chair super white glove delivery - Ivan S.
I ordered two HTT-10CRP chairs 24 November and received them yesterday morning. They are setup and working just great. I am impressed with the easy and efficiency with which I was able to place the order via your web site and the speed with which they were received. Thank you very much for a job well done. Happy Holidays, - John W.
*WARRANTY INFORMATION: New HT-125 Signature Human Touch / Interactive Health Massage Chairs have a "5/1/1" Limited warranty. Signature HTT™ and HT™ massage chairs come with a manufacturer's five-year limited warranty against structural defects (Frame only - cosmetics are not covered). Factory Parts are covered for 1-year from the original date of purchase. In-Home service (parts and labor) is covered for 1-year from the original date of purchase for chairs in the US 50 states and most major cities in Canada only. Refurbished Massage Chairs have a 90 Day limited residential use warranty for parts only. Chairs are packed for shipping and require minor assembly. White Glove delivery, setup and box removal is available on all chairs to most US addresses for an additional fee. Warranty is not valid for chairs shipped out of the United States and Canada. In-Home Service is only available in the US 50 states and most major Canadian Cities. Extended warranties are available on New HT-125 Massage Chairs Only. More Warranty Information.